After creating a ruckus over a ruling of the Speaker on zero hour leading to an adjournment, the Shiromani Akali Dal (SAD) chose the discussion on the Motion of Thanks on the Governor's Address to mount an attack on the state government by reverting to the excise auctions in the Punjab Vidhan Sabha today. 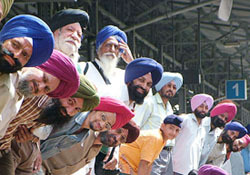 As many as three trains were pressed into service for a Sikh jatha which left for Pakistan to celebrate Baisakhi festival here today. There were 3000 pilgrims in this jatha. The Minister of State for Railways, Mr Naranbhai J. Rathwa, flagged off the first metre gauge AC chair car coach, manufactured by Rail Coach Factory (RCF), here today. While blowing its trumpet of launching an anti-corruption” campaign against Akali leaders after taking over the reins of the state, the Amarinder Singh government seems to have forgotten to look within. The DIG, Ludhiana range, Mr Parag Jain, today summoned all records of the Employees Provident Fund (EPF) scam involving contractors and officials of Guru Gobind Singh Super Thermal Plant, Ropar, and the Lehra thermal plant. The investigating officer from Ropar has been called by the DIG to furnish all details in this regard. For sure, it was a sort of political coup executed this morning with finesse by the BSP leader, Ms Mayawati, in Pabhat village on the fringe of City Beautiful. The BSP leader, Ms Mayawati, whose party has been supporting the UPA government from outside, said today that her party would give some more time to Dr Manmohan Singh's government at the Centre to order reservation in jobs in the private sector for the Scheduled Castes, the Scheduled Tribes and backward classes. A widowed mother of five children in mid forties has not been able to convince the Punjab Police for eight months that she had allegedly been raped by an uncle of her husband in Fatehgarh district. The report of three members of a five-member sub-committee, constituted by SGPC to review the dossier on Harmandar Sahib, has dubbed the document as being against the very spirit of the Sikh Gurdwara Act, 1925, and amounting to the denigration of Akal Takht and other age-old Sikh institutions. The wish of getting a satisfying meal and other basic amenities remains an unfulfilled dream for the inmates of the local observation home. They are allegedly underfed and have been living in unhygienic conditions due to apathetic attitude of authorities concerned. A local industrialist, Mr Rajesh Jalota, and a Kota businessman, Mr Lalit, who recently went to a pilgrimage to Mata Vaishno Devi Shrine in Jammu and Kashmir, were relieved when they were handed over their bags which they thought had been lost. Two labourers had a miraculous escape when they were trapped in a mudslide while they were digging a well at Bhokhra village, near here, today. Mr Avtar Henry, Food and Supplies Minister, today informed the Punjab Assembly that all 1,600 brick-kilns have started functioning in Punjab. Responding to a question asked by Mr Gurbinder Singh Atwal, he said first-class bricks were being sold at a price ranging from Rs 1,500 to Rs 2,200 per thousand. The minister said there would be no shortage of bricks during the coming months. The supply of the poor quality of coal continued affecting power generation and putting more burden on maintenance cost in the Guru Gobind Singh Super Power Thermal Plant (GGSSTP) here with 1260 MW capacity for the past many years. But the PSEB appears to be helpless to improve the quality of coal. Adequate arrangements have been made by the local administration in connection with the purchase of wheat in various mandis. Fruit and vegetable vendors carrying on their business on rehris went on strike today. BSNL employees today staged a dharna against their local authorities. The profile of each village in Punjab will be available on the Internet once block samiti offices in the state are computerised. Workers of the Shiromani Akali Dal (Amritsar) today protested against the alleged misbehaviour of a son of the manager of Gurdwara Takht Sri Kesgarh Sahib with Dalit women of the town. The Division Bench comprising Chief Justice Mr Justice D.K. Jain and Mr Justice Hemant Gupta on Monday directed owners/occupiers of PUDA houses/plots in the urban estates of Punjab to comply with the guidelines framed by PUDA on encroachments along road berms within three months. The Improvement Trust earned Rs 8.37 crore by auctioning 25 commercial and residential plots here today. The police clearance certificate (PCC) to people for the purpose of submission to foreign diplomatic missions in India for visa and migration purposes will be issued by the Regional Passport Office, the Deputy Commissioner said here today. The local police yesterday busted a three-member gang involved in making fake certificates, registration certificates of vehicles, fixed deposit receipts of banks, income tax returns and birth certificates. The police recovered a large number of certificates and stamps from their possession. The district police today arrested an Amritsar resident for smuggling of narcotics and seized heroin valued at Rs 3 crore from his possession. The Malerkotla police has unearthed a racket of fake degrees and certificates of different boards and universities with the arrest of five members of a gang. A Punjab Police Sub-Inspector who had earlier served in the Vigilance Department was today caught red-handed by personnel from his former department while accepting a bribe of Rs 10,000. The district police today claimed to have busted a five-member gang of robbers with the arrest of three of its members from the cremation ground at Saintpur village while they were allegedly planning to commit a robbery. Punjab needs to strengthen its economy by long-term planning or policies in the agriculture and health sectors, said Dr Ishar Ahluwalia, Vice-Chairperson, Punjab Planning Board, while interacting with the faculty of Guru Nanak Dev University here today. Dr Lalit M. Bhardwaj, Head, Bio-Molecular Electronics and Nano-technology, Central Scientific Instruments Organisation (CSIO), Chandigarh exhorted students to be innovative and avoid duplication. He urged them to undertake path-breaking work in nano-biotechnology, as it was an upcoming science with enormous growth potential. Go global — that is what a committee constituted by the Punjab Government for preparing a document on higher education has recommended. In its report submitted today to Punjab’s Deputy Chief Minister Rajinder Kaur Bhattal, the committee has suggested the introduction of fresh courses for students living abroad. The SGPC has announced that this year’s eligibility test for Sikh quota seats in the SGPC-managed technical institutes will be conducted by Baba Banda Singh Bahadur Engineering College (BBSBEC), Fatehgarh Sahib, on June 12. Students of BA (I), appearing in the annual examinations of Guru Nanak Dev University, Amritsar, were surprised today when they found the English (compulsory) question paper was outside the syllabus. According to students, questions worth 21 marks out of 100 were outside the syllabus.